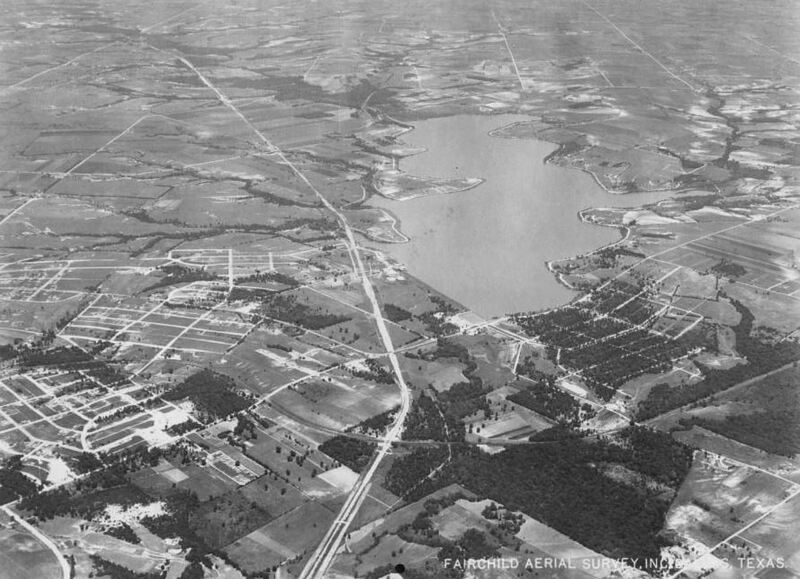 Above, a striking view of White Rock Lake, looking north, with Garland Road and the Houston & Texas Central Railroad tracks (becoming the Texas & New Orleans Railroad tracks in 1934) crossing at the lower center of the photograph, just southwest of the lake. Another Fairchild Aerial Survey photo is below — this one is from 1926, and its wider view shows just how undeveloped this area was at the time. Top photo from the very interesting article “From Water Supply to Urban Oasis: A History of the Development of White Rock Lake Park” by Steven Butler (Legacies, Fall 2002), here. 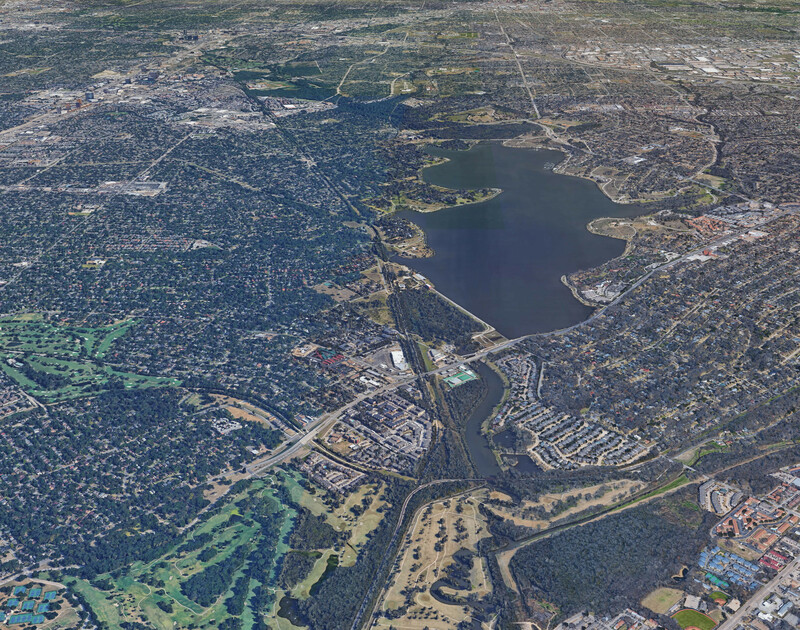 Bottom photo, titled “White Rock Lake Aerial Overview (Unlabeled)” is from the DeGolyer Library, Central University Libraries, Southern Methodist University; it can be accessed (and magnified greatly) here. The “labeled” version — which identifies roads and landmarks — is here. 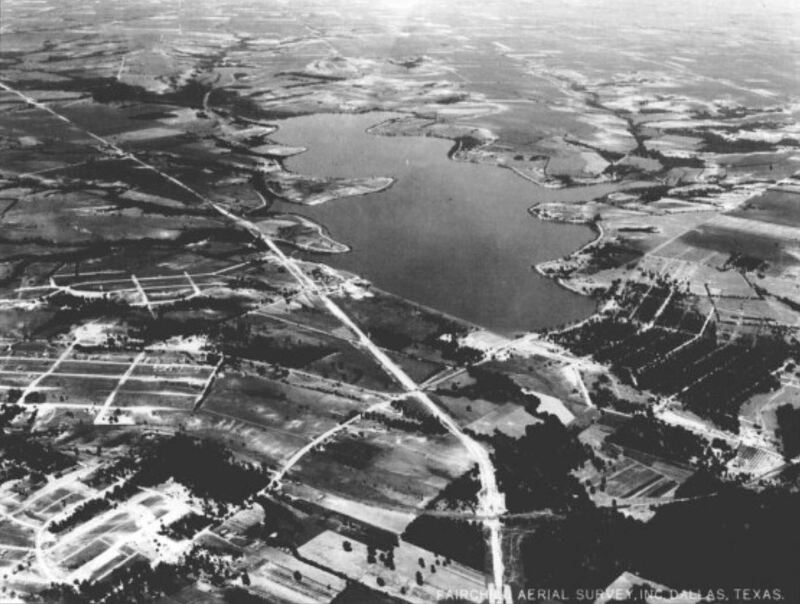 From the SMU description: “This is one of 38 photographic prints taken by Fairchild Aerial Survey, Inc. of White Rock Lake for Dr. Samuel G. Geiser, SMU.” The full set of the White Rock Lake aerial photos is here. A map here shows where the grid maps are in relation to the lake as a whole. Thanks to “Not Bob” for linking to the Google Earth image in the comments! These photos are big. Click them! Very interesting post Paula, especially since I can see exactly where I live today, which back then was nothing but fields. Also interesting since this is pre Northwest Highway days. You can also clearly make out White Rock Creek at the far north end of the lake and even more clearly the watershed areas for Rush Creek, Williamson Branch Creek and McCommas Branch Creek. Today its only a guess where these creeks are except for the spot where they empty into White Rock Lake. Thanks for posting. Thanks for the link to the Legacies’ article. It does have many interesting tidbits in it. For example, the original unpaved Lawther Drive, which can be seen around the lake in both photos, was built by Dallas city jail prisoners. Along those same lines, there was a city prison farm which was nicknamed the “Pea Patch” and was located behind the dam and pump house where non violent offenders worked off their fines at one dollar per day. Also, when the boathouse was constructed on the west side of the lake in 1930 at the same time as the bath house on the eastern shore, the bus service was extended out to the boathouse to accommodate the many Dallasites who did not own cars. From there residents could transfer to motorboats to cross the lake to the bath house beach. My favorite part was about the Pea Patch workers. Thanks for that great present-day image! !